Significant protected views over Landmark Cathedral w/city skyline. N/E bay windows. Just completed luxury updates w/100% atten. to details: Custom Paint, New Light Fixt., Kitch Bksplsh, faucet and new BR carpet. Kitch has Brookhaven Cabs, granite counters, Bkfst bar and pass-thru. Upgraded S/S Applcs. Dbl convection oven, gas range. Split 2BR/2BA open Flr plan. Overszd Base and Crown Moldings. Oak Hdwd Flrs. Generous Closets. Sd-by-Sd wash/dry. Spa MBath w/Marble Dbl-bowl Vanity. Jacuzzi Tub and Sep. Shwr. Private recessed Balc. off Liv.Rm. Pet Friendly! 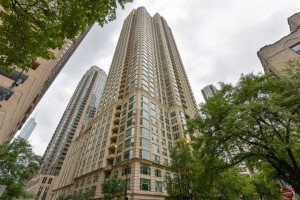 Chic and stylish unit in Premier Bldg w/sophisticated, luxurious amenities! 24-Hr Door Staff, gym, Indoor Pl, Hot tub, Spa, Party Rms, Theater Rm, resort-quality outdoor sundeck/garden with Lounge Chairs, etc. Favored "Cathedral district" location. World-class Shopping, numerous grocery options, High-rated restaurants, etc. This is a good value in the Fordham, where you'll find units in the $3 Million range!Come home to this quality lifestyle!